-Read the excerpt below from Tom Blumer's Media Research Center post. The trouble is that the tweet’s AP link no longer contains the quoted verbiage. Readers going there who are unfamiliar with the AP’s shenanigans will have every reason to believe that tweeter was deliberately misleading them. The quoted language wouldn’t appear in the search results above unless it was once actually there in the underlying web pages. Each of the first three listings now goes to the same story (saved here for future reference, fair use and discussion purposes) at AP’s national site. Hagel’s quote isn’t there. 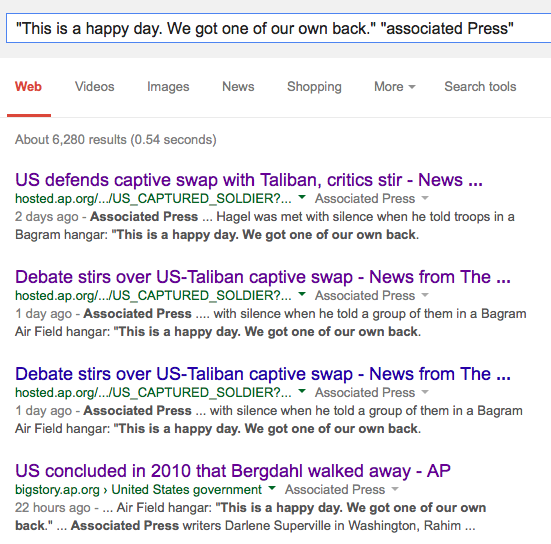 Hagel’s name isn’t even in the dispatch now posted. The fourth listing goes to the AP’s “Big Story” web site, which has apparently been designed to be the wire service’s permanent record of its work. 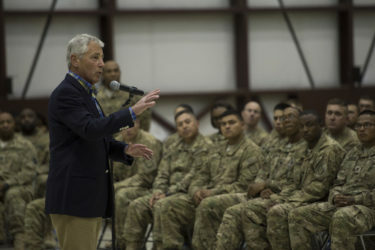 The quote’s not there either, nor is Hagel’s name — which is really rich, because “Hagel” is one of the story’s tags, meaning that future searchers will come to the page expecting coverage of Hagel and will get none. Tireless campaigners for their son’s freedom, Bob and Jani Bergdahl thanked all who were behind the effort to retrieve him. “You were not left behind,” Bob Bergdahl told reporters, as if speaking to his son. “We are so proud of the way this was carried out.” He spoke in Boise, Idaho, as residents in the sergeant’s hometown of Hailey prepared for a homecoming celebration. Unskeptically relaying General Dunford’s questionable assertion about “excitement that spread through U.S. ranks” is bad enough. But the [suggestion] that the silence might have been due to “reluctance to display emotion” [is unlikely]. Even “doubts among the troops about Bergdahl” downplays the situation. “Anger at someone they believe was a deserter and a possible enemy collaborator” is more like it. AP and other outlets sholdn’t be revising away initial reports which represent the real first draft of history in favor of the history as they want it presented. 1. What type of bias does the report from Tom Blumer illustrate? 2. Mr. Blumer asserts: “The [suggestion] that the silence [of the soldiers to Secretary Hagel’s announcement that Bowe had been freed] might have been due to ‘reluctance to display emotion’ [is unlikely]. Even ‘doubts among the troops about Bergdahl’ downplays the situation. ‘Anger at someone they believe was a deserter and a possible enemy collaborator’ is more like it. Do you agree with his assertion? Explain your answer. 3. Mr. Blumer also says, “AP and other outlets shouldn’t be revising away initial reports which represent the real first draft of history in favor of the history as they want it presented.” Do you agree with this assertion? Explain your answer. 1. Tom Blumer illustrates bias by spin and revision.